I know this is an old post but- after something hit the underside on the freeway pretty hard, I decided to put these on. Your pics helped with orientation and location. It did speed things up! Thanks! Feel better knowing they're helping at least a little, especially on the fuel tank. After my fiasco with the Stillen/CSF radiator not fitting in the V8, I thought I might have the same problem with these, but they fit perfectly. Easy install. Where were you able to find the transfer case plate? I've been looking online and can't find it anywhere. All I find is the gas tank and engine covers. I called my local dealership and read the parts guy the part numbers listed in one of the previous posts in this thread. I did ask him for internet pricing and he said yes (whatever that discount might have been). The prices were really close to what RacerZX lists in the original post (and that was 11 years ago), so they've not gone up much. The parts guy didn't have any trouble still finding all of them, though they did have to come from separate places. Hope this helps. I don't off-road anymore, but I like having them. Got the engine one on. Went to Home Depot and bought some bolts instead of the OEM ones to use because of cost (about $1.50 each). Ordered the engine plate online and opted for pick up at Town North Nissan here in Austin so luckily skipped on shipping costs. Bolts are zinc plated 10.9 grade which is overkill, but they were $3.00 for the 4 I needed. Size was M8-1.25 x 30mm, but you could save a little and go a shorter length like 20mm if you choose. Washers are 5/16 and were either galvanized or zinc coated (can't remember) and cost $.15 each. The bolt head was a 13mm. The threading when putting this on was a little difficult at first possibly due to dirt and crap built up on the threads. As others have said, the quality of the pan is not heavy duty by any means, but it's better than nothing on there. I'll end up doing the gas tank next and using the same bolts from Home Depot. Guy in parts department stated that the transmission case plate number is not valid in their system. Said the 2nd part of the part number wasn't correct. He did manage to pull up the engine cover and gas tank skid using the part numbers in this thread though. I'll look around and see if there is a different part number for it, but if someone knows of a different valid one, please let me know. ImgBB - Free photo uploads! 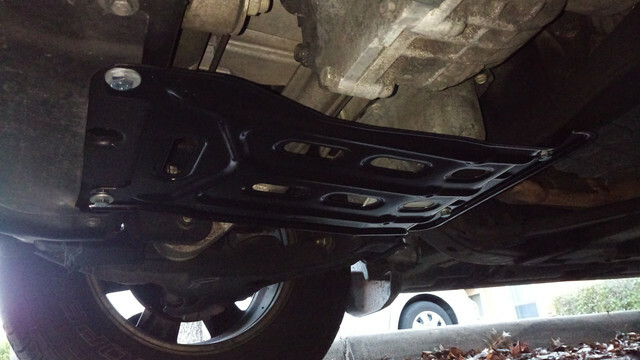 "The engine cover skid plate is part number 50842-ESPFR and lists for $14.72. The transfer case cover skid plate is part number 50884-TSP00 and lists for $14.02. And the fuel tank skid plate is part number 50890-EA500 and lists for $105.39. Don't forget to get 13 skid plate bolts, part number 01121-06561 and are $.60 each." 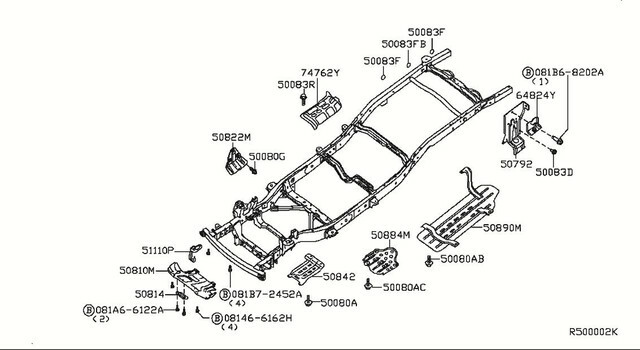 Now that I see them, seems like I used the 2nd set from Nissan Online Parts. The bottom set of part numbers (set 2) are the correct ones. Hell yeah! Was just able to pull it up on my local dealers parts page. The search for 508847S000 worked (had to remove dash for their system). Thanks guys.